When my bride, Shelby, booked me for month-of-coordination, I was immediately impressed by her superb planning abilities. All of the numbers checked out, lists checked off, and vendors checked in. 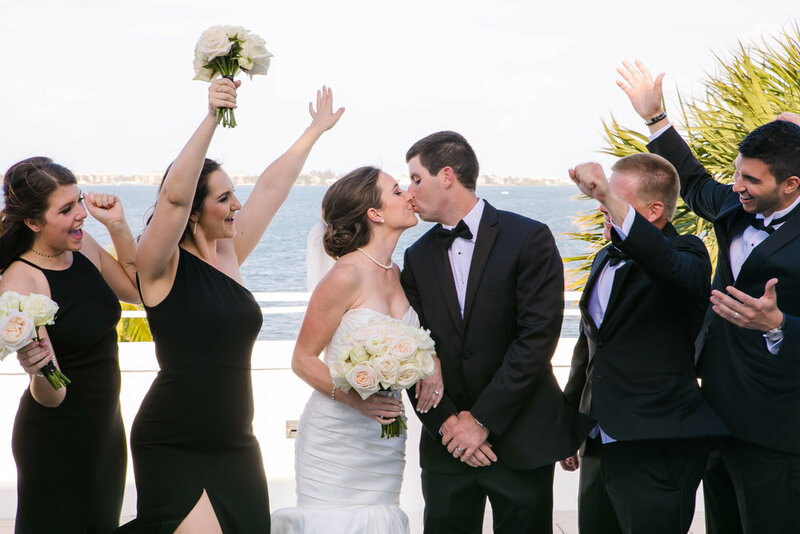 The location being The Mansion at Tuckahoe was an extraordinary blank slate venue that is just off the beach in Jupiter, Florida which is off-the-beaten track of the typical destination wedding agenda of South Beach and Fort Lauderdale. The venue hosts a beautiful manicured lawn with ocean views. The mansion's terrace hosted the ceremony, then casually directed guests into their three large, open- concept rooms for the cocktail hour. Between MB Floral Designs and Shelby's crafty DIY decor pieces, the foyer was transported into a stunning cocktail reception with blooms brimming on the fireplace mantels while guests lingered to grab their drinks. The Mansion is also a very convenient place for the bridal party to unwind and set the canvas for their portraits with Andrea Harborne Photography and Shelby was able to do some readings for their video crew, Affinity Wedding Films. After the nuptials were complete, they were able to dive into the fun stuff: food, sweets, and entertainment. The reception was 200 plus feet away from the mansion, so we lined the pathway with glowing lanterns, and the large white tent hosted Shelby's homemade chandeliers that draped from its peaks in the interior. The tables rotated black and black/white striped linen with gold chargers, hundreds of candles, and lush centerpieces. Regardless of the winds streaming off of the ocean front, the party carried on thanks to DJ Live Productions. Guests enjoyed a delicious meals by The Roasted Fig and cake to follow by Johnson's Custom Cakes. Between the stunning weather we received, superb planning of each detail of the event, and unstoppable fun vibes we definitely hit the jackpot on pulling off a perfect wedding day. To view more photos from this event, head on over to the Shelby + Eric's full gallery page. You can also find this wedding published in Wedding Lovely.